Download "The Law Office of Linda M. Hoffman, P.C. 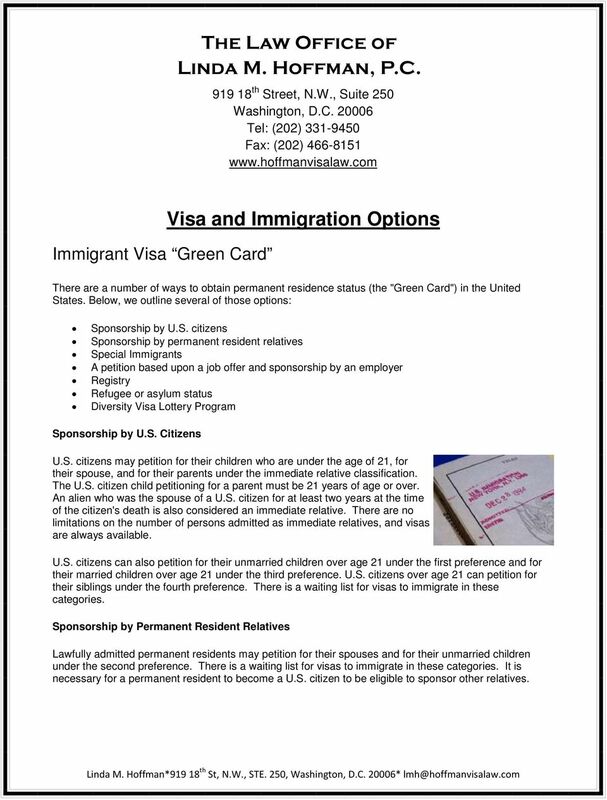 Visa and Immigration Options"
1 The Law Office of Linda M. Hoffman, P.C th Street, N.W., Suite 250 Washington, D.C Tel: (202) Fax: (202) Immigrant Visa Green Card Visa and Immigration Options There are a number of ways to obtain permanent residence status (the "Green Card") in the United States. Below, we outline several of those options: Sponsorship by U.S. citizens Sponsorship by permanent resident relatives Special Immigrants A petition based upon a job offer and sponsorship by an employer Registry Refugee or asylum status Diversity Visa Lottery Program Sponsorship by U.S. Citizens U.S. citizens may petition for their children who are under the age of 21, for their spouse, and for their parents under the immediate relative classification. The U.S. citizen child petitioning for a parent must be 21 years of age or over. An alien who was the spouse of a U.S. citizen for at least two years at the time of the citizen's death is also considered an immediate relative. There are no limitations on the number of persons admitted as immediate relatives, and visas are always available. U.S. citizens can also petition for their unmarried children over age 21 under the first preference and for their married children over age 21 under the third preference. U.S. citizens over age 21 can petition for their siblings under the fourth preference. There is a waiting list for visas to immigrate in these categories. Sponsorship by Permanent Resident Relatives Lawfully admitted permanent residents may petition for their spouses and for their unmarried children under the second preference. There is a waiting list for visas to immigrate in these categories. It is necessary for a permanent resident to become a U.S. citizen to be eligible to sponsor other relatives. 3 3 other allowances. In requesting the G-4 visa the domestic partner will need to provide the relevant U.S. consulate "appropriate evidence" to show that he or she is a member of the principal alien's household. What constitutes "appropriate evidence" will be up to the particular consulate. The domestic partner can request a G-4 visa at a U.S. Consulate or in some circumstances can change status while in the U.S. from another nonimmigrant visa category to G-4. G-4 Domestic Partners are eligible to apply for work authorization through the international organization following the same procedures as other eligible G-4 dependents. Employer Petitions PERM (Labor Certification) When an employer sponsors a foreign national for permanent residence, he or she must show that the individual will not be taking a job from a U.S. worker. 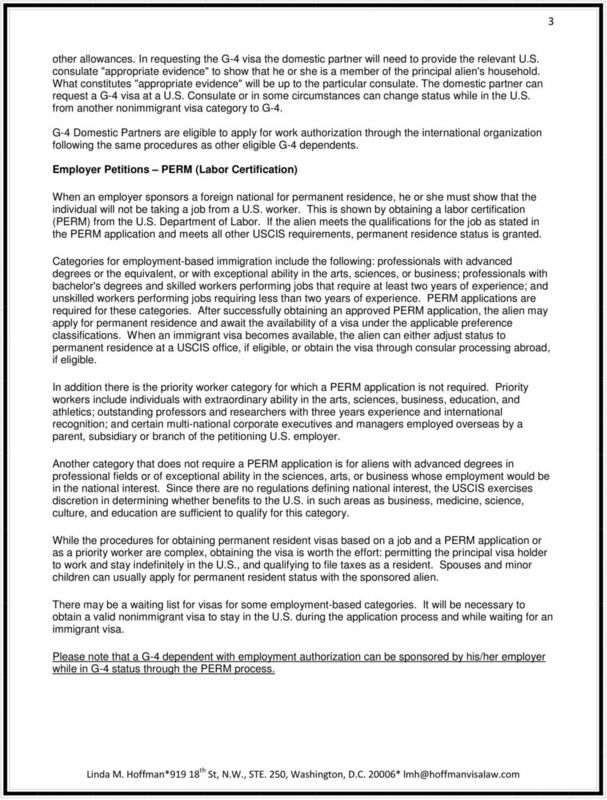 This is shown by obtaining a labor certification (PERM) from the U.S. Department of Labor. If the alien meets the qualifications for the job as stated in the PERM application and meets all other USCIS requirements, permanent residence status is granted. Categories for employment-based immigration include the following: professionals with advanced degrees or the equivalent, or with exceptional ability in the arts, sciences, or business; professionals with bachelor's degrees and skilled workers performing jobs that require at least two years of experience; and unskilled workers performing jobs requiring less than two years of experience. PERM applications are required for these categories. After successfully obtaining an approved PERM application, the alien may apply for permanent residence and await the availability of a visa under the applicable preference classifications. When an immigrant visa becomes available, the alien can either adjust status to permanent residence at a USCIS office, if eligible, or obtain the visa through consular processing abroad, if eligible. In addition there is the priority worker category for which a PERM application is not required. Priority workers include individuals with extraordinary ability in the arts, sciences, business, education, and athletics; outstanding professors and researchers with three years experience and international recognition; and certain multi-national corporate executives and managers employed overseas by a parent, subsidiary or branch of the petitioning U.S. employer. Another category that does not require a PERM application is for aliens with advanced degrees in professional fields or of exceptional ability in the sciences, arts, or business whose employment would be in the national interest. Since there are no regulations defining national interest, the USCIS exercises discretion in determining whether benefits to the U.S. in such areas as business, medicine, science, culture, and education are sufficient to qualify for this category. While the procedures for obtaining permanent resident visas based on a job and a PERM application or as a priority worker are complex, obtaining the visa is worth the effort: permitting the principal visa holder to work and stay indefinitely in the U.S., and qualifying to file taxes as a resident. Spouses and minor children can usually apply for permanent resident status with the sponsored alien. There may be a waiting list for visas for some employment-based categories. It will be necessary to obtain a valid nonimmigrant visa to stay in the U.S. during the application process and while waiting for an immigrant visa. 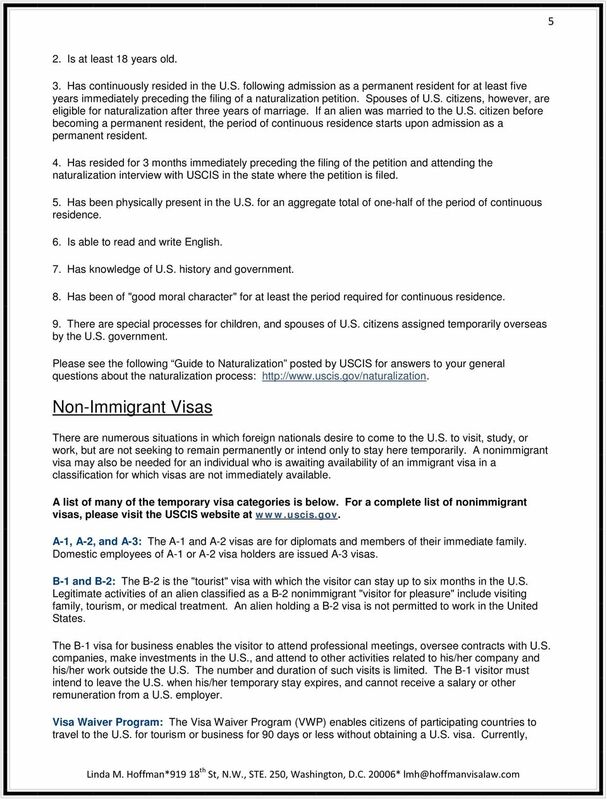 Please note that a G-4 dependent with employment authorization can be sponsored by his/her employer while in G-4 status through the PERM process. 4 4 Registry Applications Registry is a procedure whereby an alien who has resided continuously in the U.S. since before January 1, 1972, and is not otherwise inadmissible, may obtain permanent resident status. Refugees and Asylees Refugees and Asylees seek to reside permanently in the U.S. because of persecution in their home countries. Refugees are not yet in the U.S. and apply for admission at U.S. consulates abroad. Asylees are already in the U.S. and are unable to return to their home countries. Under the Refugee Act of 1980, the President, in consultation with Congress, determines an annual numerical quota for the admission of refugees and Asylees. The standard for qualifying as an asylee or refugee is an inability to return home due to a "well-founded fear of persecution on account of race, religion, nationality, membership in a particular social group, or political opinion. "Winning asylum and refugee cases can be very difficult and requires a great deal of documentation. The State Department can issue advisory opinions to USCIS on asylum, advising in favor of the granting of asylum in few cases. The body of law which addresses the fleeing of persecution involves numerous complex, statutes, regulations, and international laws. There are also deadlines which impact eligibility. It is recommended that the foreign national contact an immigration specialist with specific experience in this highly complicated and controversial area. Diversity Visa Program This program provides 55,000 diversity visas annually to natives of countries selected through a complicated formula based on the numbers of immigrants to the U.S. by country and region. Eligible countries will be designated by the State Department each fiscal year. The list of countries can be expected to change from year to year. To qualify under the diversity program, a foreign national must come from a designated country, have at least a high school education, or have worked at least two years in an occupation requiring two years of experience or training. Re-entry Permit Once you become a lawful permanent resident, you need to maintain and protect that status. If you travel outside the United States and stay outside the United States for more than 6 months, you may encounter difficulties with the USCIS officers at the United States port-of-entry upon your return. Staying outside the United States for more than 6 months can also create difficulties for you if you ever decide to apply for United States citizenship. Any absence from the United States for more than one year will be treated by USCIS as abandonment of your permanent residence and your status will be terminated. Therefore, if you plan to be outside the United States for more than 6 months, it will be advisable for you first to obtain a re-entry permit from the USCIS. Please note that you must be physically present in the United States at the time the application for the re-entry permit is filed with the USCIS. 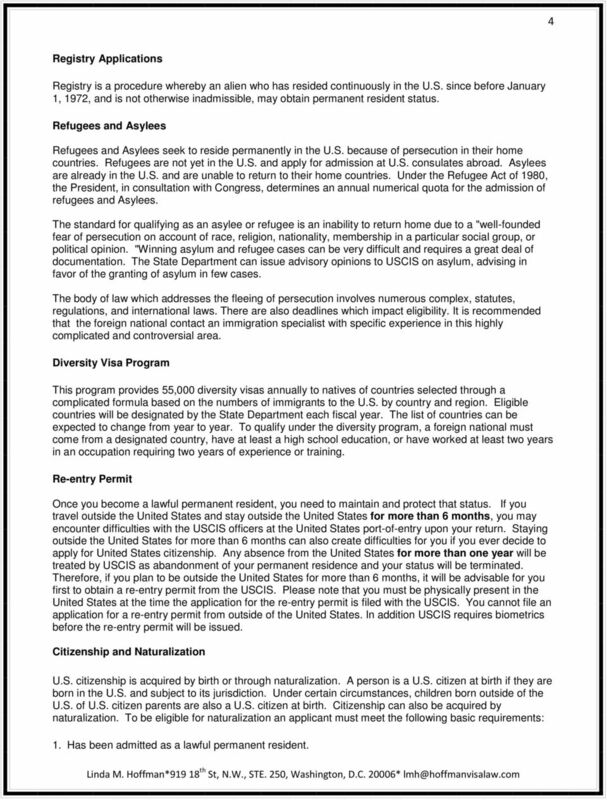 You cannot file an application for a re-entry permit from outside of the United States. In addition USCIS requires biometrics before the re-entry permit will be issued. Citizenship and Naturalization U.S. citizenship is acquired by birth or through naturalization. A person is a U.S. citizen at birth if they are born in the U.S. and subject to its jurisdiction. Under certain circumstances, children born outside of the U.S. of U.S. citizen parents are also a U.S. citizen at birth. Citizenship can also be acquired by naturalization. To be eligible for naturalization an applicant must meet the following basic requirements: 1. Has been admitted as a lawful permanent resident. 8 8 O-1: This visa is for individuals who have demonstrated extraordinary ability in the sciences, arts, education, or athletics. The alien must be coming to the United States to continue working in his/her area of extraordinary ability. The O visa is initially granted for the duration of the particular project or assignment up to three years. An alien must have a U.S. employer petitioning for O status. P: The P visa covers entertainers and athletes who cannot qualify under the extraordinary ability standard for the O category. 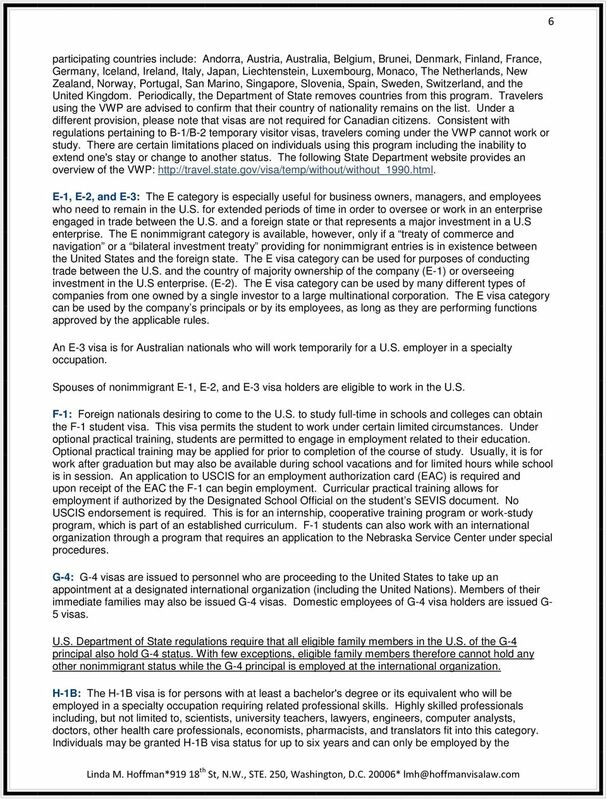 Q: The Q visa is for aliens engaged in certain international cultural exchange programs that give the alien practical training and employment. TN (Trade NAFTA Status): The U.S., Canada, and Mexico entered into the North American Free Trade Agreement ( NAFTA ), which provides for expedited admission of businesspersons and professionals to be employed by U.S. companies. 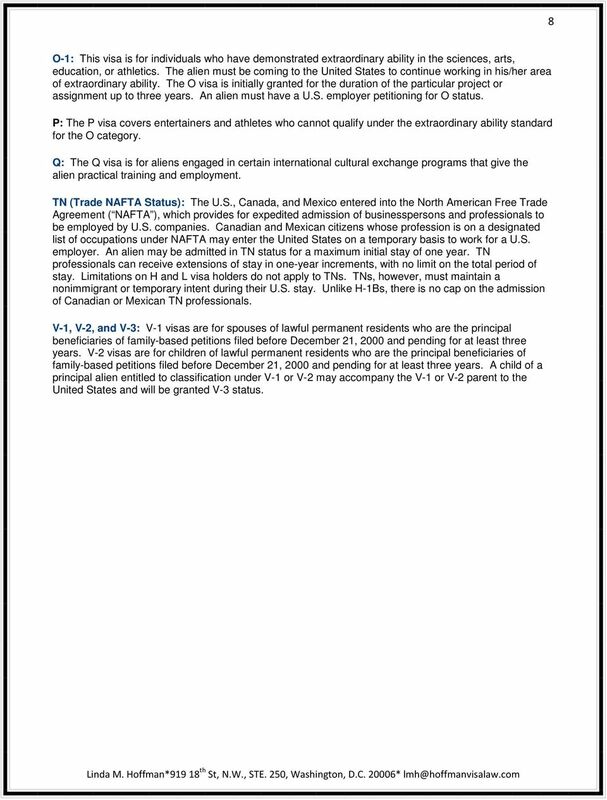 Canadian and Mexican citizens whose profession is on a designated list of occupations under NAFTA may enter the United States on a temporary basis to work for a U.S. employer. An alien may be admitted in TN status for a maximum initial stay of one year. TN professionals can receive extensions of stay in one-year increments, with no limit on the total period of stay. Limitations on H and L visa holders do not apply to TNs. TNs, however, must maintain a nonimmigrant or temporary intent during their U.S. stay. Unlike H-1Bs, there is no cap on the admission of Canadian or Mexican TN professionals. V-1, V-2, and V-3: V-1 visas are for spouses of lawful permanent residents who are the principal beneficiaries of family-based petitions filed before December 21, 2000 and pending for at least three years. V-2 visas are for children of lawful permanent residents who are the principal beneficiaries of family-based petitions filed before December 21, 2000 and pending for at least three years. 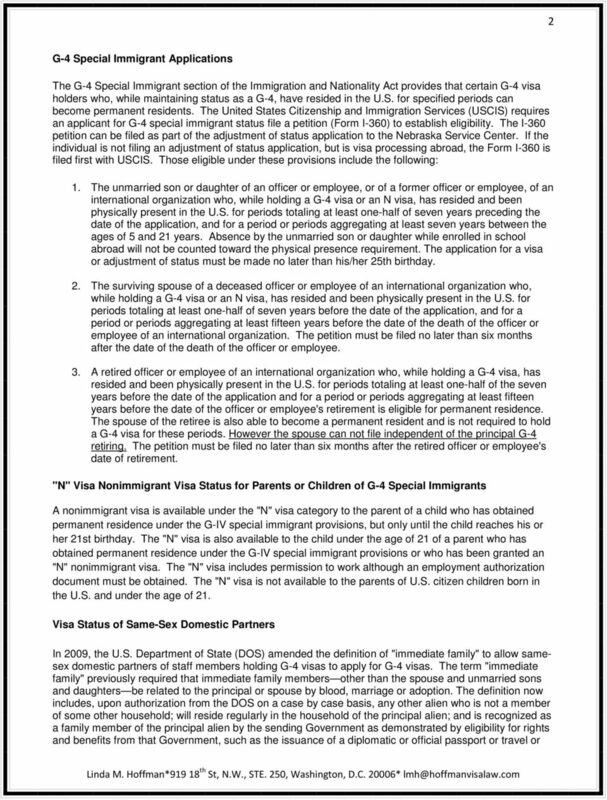 A child of a principal alien entitled to classification under V-1 or V-2 may accompany the V-1 or V-2 parent to the United States and will be granted V-3 status. 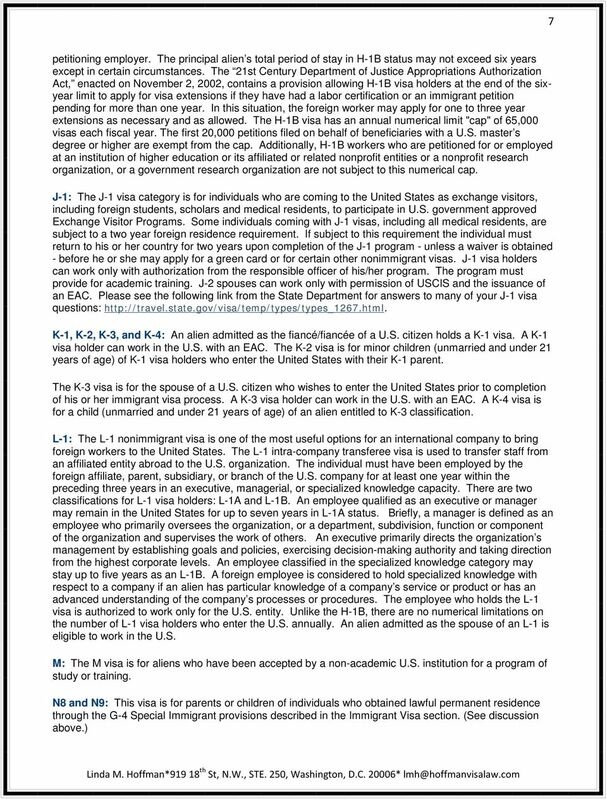 U.S. Immigration Options for Graduating Students and Other Professionals A Smorgasbord of Choices. By Bernard P. Wolfsdorf and Naveen R.
Our Mission. Paschal Nwokocha Law Offices Crown Roller Mill, 105 Fifth Avenue South, Suite 550, Minneapolis, MN 55401 www.paschal law.com 612.465.